The Sebastian Velona Foundation to cure CLN8 Thirteen-year old Sebastian Velona is a Santa Clarita resident. 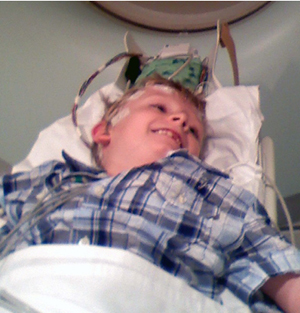 When he was four, he suffered his first seizure. By six, his eyesight began failing. Shortly after, his motor skills and cognitive abilities began declining. By eight, doctors diagnosed him with Batten Disease CLN8 – a degenerative and fatal neurological disorder. Without help, Sebastian will deteriorate to a vegetative state and likely die in his twenties. In April 2016, Sebastian’s family learned about promising results in clinical trials using gene replacement therapy to treat genetic disorders. The therapy replaces mutated genes with new genes delivered to the brain. Sebastian’s family approached the scientists and asked if gene therapy could be used to treat CLN8. Fortunately, the scientists said it could be done. Unfortunately, they said it would cost around $3.5 million for research, development, FDA approvals and trials. Without hesitation, Sebastian’s family established the Sebastian Velona Foundation to cure CLN8. Currently, it is raising money to fund gene replacement research and therapy. And, in just a few short months, the Foundation has garnered media coverage from local publications to ESPN, the PGA Tour and NBC’s The Golf Channel. For some children, the hope of gene therapy comes too late. In Sebastian’s case, he’s in a race against time. If he doesn’t receive the treatment in a year, his condition will deteriorate too far, and he won’t be a candidate. This urgency is driving the Foundation to raise the money necessary to give Sebastian, and others like him, a fighting chance at beating CLN8. On May 13, the Foundation will host the #HealingHugs Festival for a Cure at Afterburn Fitness in Valencia. The festival, which is open to the public, will feature fitness challenges, a beer & wine garden, food trucks, music, entertainment, auctions and local businesses offering products and services. Admission is free; however, there are fees to participate in the fitness challenges and to reserve VIP Tables in the beer garden. The Foundation is a project of The Giving Back Fund, a 501(c)(3) charity, and festival proceeds will benefit the Foundation. To learn more about the Foundation, visit www.CureBattenCLN8.org. To register for fitness challenges, to reserve VIP Tables and to secure priority access to the beer garden, visit www.Healing- HugsFestival.com. If your business would like to participate or donate auction items, then contact Michael Fox at MichaelEricFox@yahoo.com. You can follow the Foundation on Facebook.com/HealingHugs4Sebi, Twitter.com/CureBattenCLN8 and Instagram.com/SebastianVelona.